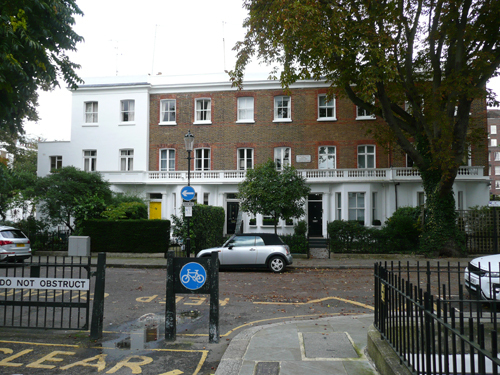 In the mid-nineteenth century Oakley Crescent (later Oakley Gardens) was constructed to the west of Manor Street on the site of a former Dairy House that was originally associated with Chelsea Manor. 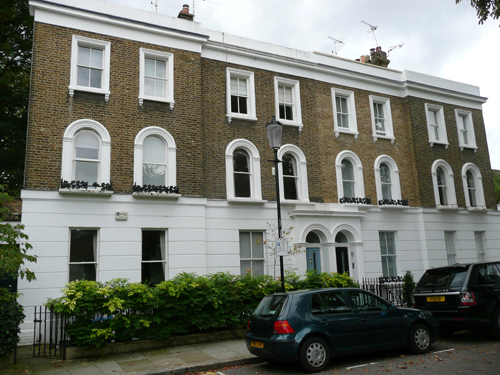 Oakley Crescent was developed around a garden square and contained terraced houses to the north and south. 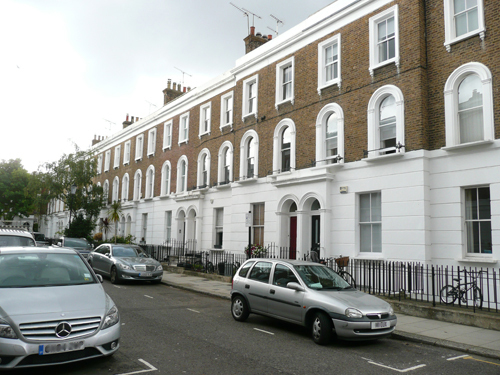 To the west of the site small terraces framed the junction of Phene Street, and in the two corner plots semi-detached houses were laid out diagonally to face the square (one of these has subsequently been turned into a single house). The garden square was infilled not long after the original development. In the mid-to-late-nineteenth century the area was undergoing rapid development in order to meet the high demand for residential property. The first edition of the Ordnance Survey map in 1862 shows the garden square under construction. 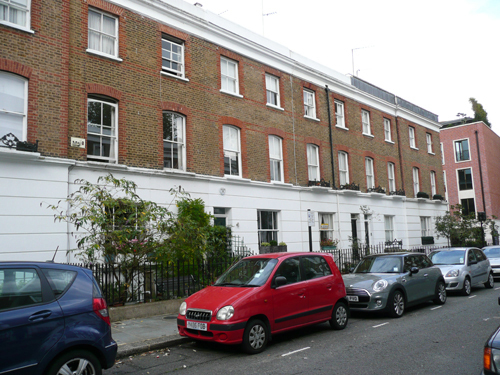 Terraced houses had been partially built on the south and north sides of the plot, and two buildings constructed fronting Manor Street. By the second edition of the Ordnance Survey map in 1894-95, the square had been completely laid out to form the present site. An examination of various late-Victorian street directories shows that Oakley Crescent was originally split into two – Oakley Crescent North and Oakley Crescent South. It also seems that the two halves were renamed Oakley Crescent by the end of the nineteenth century (1880s?) and probably renumbered. In 1965 the name was changed to Oakley Gardens. The houses around the square, Number 1 to 69 (odd), are three storey with rusticated stucco ground floors; the first floor windows arched. The corner houses are set at 45 degrees; Number 25 (formerly 23 and 25) now converted to a single dwelling, two storeys with a hipped roof, has the air of a villa; its counterpart, Numbers 43 and 45, however, follow the height of the adjoining terraces. The central houses of the square follow the three storey brick and stucco pattern and were designed as terraces with expressed symmetrical elements. The details vary in quality: Numbers 24-28 being the best, with arched front doors and first floor windows and continuous balcony with attractive arched railings. The buildings have survived with fairly minimal intervention. The external facades are nearly all of their original design but unfortunately, a number of secondary fittings such as the front boundary railings and window balconettes have been removed. Historic photographs, some early, but most dating from the 1960s and 1970s illustrate many of these original features, and helped to establish when they were removed. One of the most notable changes in both the fabric and setting of Oakley Gardens has been the replacement of the original spear-headed boundary railings with lower plain railings. Although some of the original boundary railings at Oakley Gardens are visible in photographs of the 1960s some may have been removed during the early 1940s as part of the Second World War government campaign to collect iron to be melted down and used for building weaponry. Many nineteenth century iron railings throughout the city were lost as a result of these home-front efforts. It is generally believed though that a large proportion of the collected railings were never used and were ultimately discarded. The decision must have been taken between 1966 and 1974 to remove the remaining original railing sections at Oakley Gardens and to install the current ironwork, as a number of 1974 photographs held at the London Metropolitan Archives and Royal Borough of Kensington and Chelsea Archives record the current railings in situ. The highly ornate balconettes to the ground and first floor windows of Nos 8, 10 and 14 Oakley Gardens had apparently been removed by 1966. 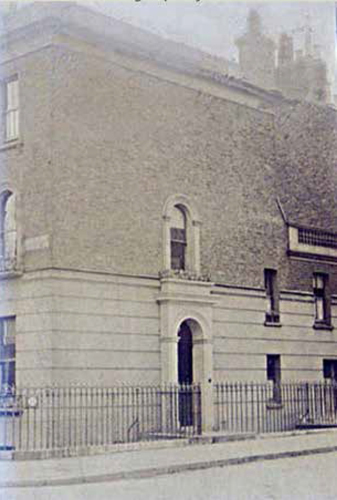 A pair of urns recorded in photograph of that year, adorn the parapet of 12 Oakley Gardens and it seems likely that a matching pair were originally located above 2 Oakley Gardens at the opposite end of the terrace. 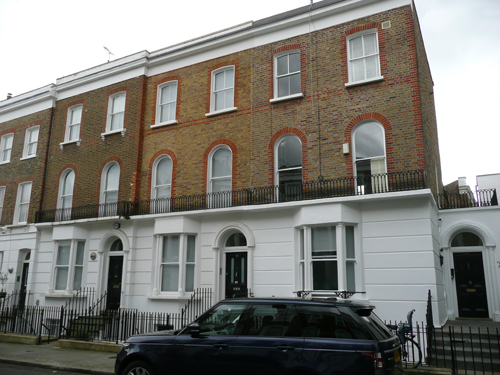 I was tasked to examine a selection of the various ironwork elements on the exterior of the houses in Oakley Gardens. The aim was to establish which were original and at roughly what date the later ones were added. At the same time a record of the colours employed and when these were applied was required. I was able to do this, to demonstrate which balconette style was original and to establish that just one short length of original railing had survived. A total of 27 decorative schemes were found on the original railings, which suggests that roughly every six years they had been repainted. 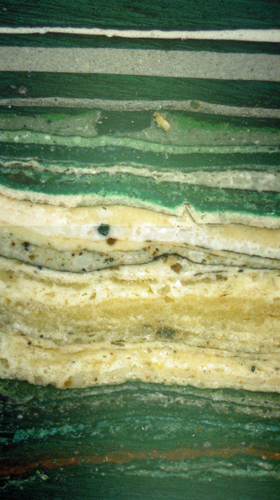 A sequence of dark greens, pale stone colours, more dark greens and latterly black were found here. The name Oakley relates to William Cadogan, 1st Earl Cadogan, who in 1718, had been made Baron Cadogan, of Oakley in the County of Buckingham. One suspects that an analysis of paint layers is often associated, by some, with Adam ceilings and Regency drawing rooms. However, I spend just as much time sampling railings, gates and bridges – not merely to establish what colours had been used but also to learn something of the changes that have taken place and at what stage in their history. The Oakley Gardens project was a perfect example of this. This has relied heavily on the historic building report produced by Donald Insall Associates in May 2015 and from information published online by RBK&C. I prefer the green/bronze green colours to the modern habit of painting railings black. 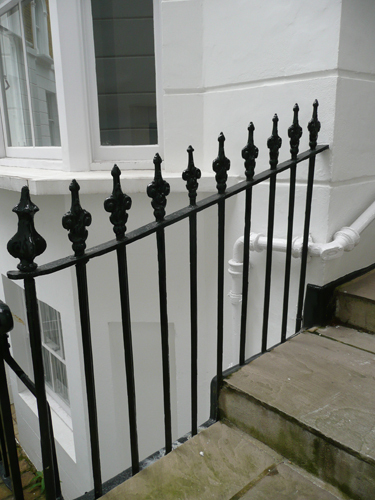 The advantage of black was that it unified the different railings of a terrace. When green was used a variety tended to be found. The ideal would be if a single dark green were specified.